Today we’re discussing with Simon Tinsley, Growth Manager at ClickMechanic about their use of exit intent popup forms. Hi Simon, could you first explain what ClickMechanic is? ClickMechanic is an online, on-demand marketplace that matches customers with local car mechanics. Our aim is to transform the automotive repair space by allowing you to easily and transparently book a mechanic online. We built a machine learning quoting algorithm to make sure you get the right price for your repair. We’ve also streamlined the booking process, tailoring it to the customer needs, such as booking a specific 2-hour slot. Little by little, we can clean up the car repair industry, often known for rip off prices or cowboy practices. Apart from WisePops, what other solutions do you use to track and optimize your conversion rate? We have several common tools such as Google Analytics, Kissmetrics, and internal dashboards that help us to understand how users interact with our site. We funnel the data into a Google Doc to understand all the trends side by side in a more accurate way. Being able to see a bottleneck is one-third of the battle, trying to fix it is another. We use VWO to conduct plenty of A/B tests from small copy tweaks to site-wide design changes. Analyzing the data from those tests to key into how users behave differently is the final part of conversion rate optimization. We can also use tools such as Hotjar to monitor any conversion drops that may have been affecting the site. What approach did you use in your exit popups? We use the exit pop-up as a lead gen tool for our in-house mechanics to diagnose vehicles over the phone and get people booked in. With this in mind, the pop-up is aimed at putting forward that diagnostic opportunity and collecting details from the customer about their vehicle, the symptoms they experience, and their contact information. Our pop-up is a one-page form that we designed to capture just the vital information for a mechanic to be able to have an idea of issues before they talk. This allows our mechanics to prepare prices and use their extensive workmanship to give an honest impartial opinion of the problem. How did you come up with the idea of using exit popups? We wanted to catch users, who weren’t engaging with the site, in a more traditional car repair funnel. Doing this on exit also means that we can paint the customers coming through this way with a more incremental brush, helping the business case to expand this service. We also liked the idea of an exit pop-up as a way to engage people if they did not find the hero appealing. Finally, we chose to have it as an exit pop-up because Google has negative penalties in their algorithms against intrusive experiences, which a full page entry pop-up is. How do you handle the leads that go through your exit popup? Our in-house team of mechanics makes hundreds of calls each week to people coming through the form. With their decades of experience, the team can diagnose issues over the phone, offering specific quotes and helping the customer to book in. We then have a series of integrations through Zapier that connect Wisepops with Pipedrive to track the customer and Google Docs for analytics. This lets us monitor the progress of specific customers in our system and identify trends in how they may be rejecting our calls or quotes. The leads that come through this way are always very happy to have had that initial call with someone who can talk them through their issues. What are the results of your exit campaign? How do you track them? We would like to do some research into dwell time on mobile, as there is no obvious exit intent like a mouse move. 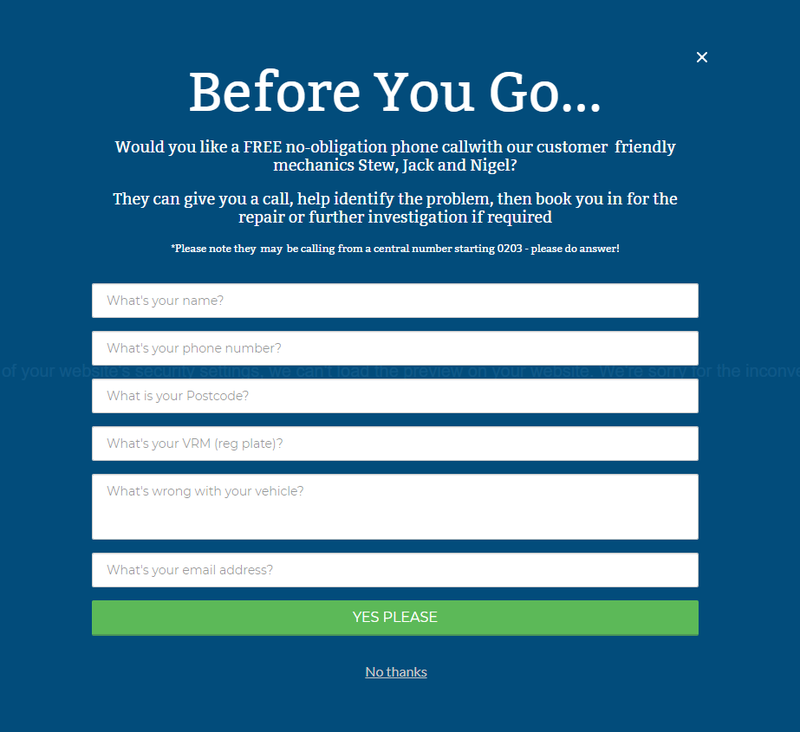 Mobile users may also want a different experience, expecting an instant call back. However we move forward with mobile, there is a lot of testing that will need to be done to get it just right. The next steps are also to see where else a banner or small sidebar pop-up may be suitable. We could offer things like discount codes or just advertise more of our selling points. The versatility of Wisepops means that we have a lot that we can try out. The examples and support available are invaluable for quickly setting up and iterating on ideas.